BUSINESSMAN-philanthropist Elmer Francisco formally filed his certificate of candidacy (COC) on Thursday afternoon at the Commission on Election (Comelec) in Cagayan de Oro City in a bid to seek mayoralty post in the May 2013 elections. 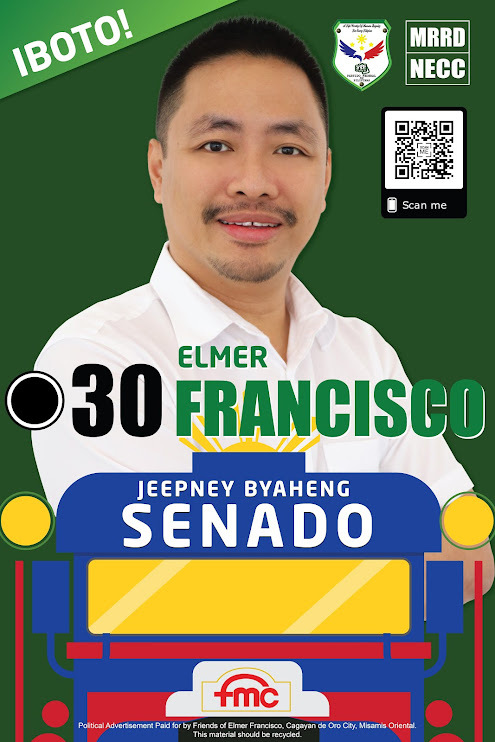 Francisco, a son of the famous Francisco Motors Corporation (FMC), the maker of Filipino jeepneys, is determined to run the race against incumbent City Mayor Vicente Emano and Liberal Party bearer Governor Oscar Moreno as the youngest independent candidate vying for the mayoralty seat. 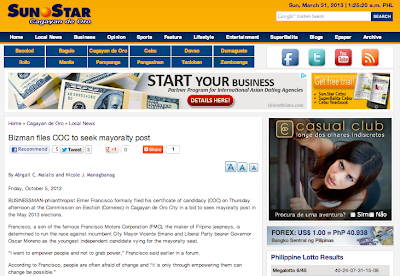 “I want to empower people and not to grab power,” Francisco said earlier in a forum.